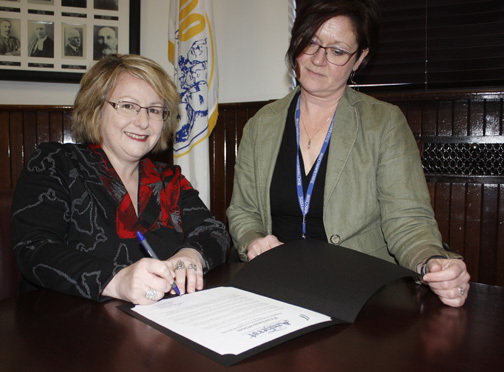 February 11-17 was proclaimed Family Violence Prevention Week in the Town of Amherst by Deputy-Mayor Sheila Christie on Feb. 11. “We in Amherst promote living in a healthy community, but living in an abusive situation is most definitely not healthy,” Christie said, as Lydia Quinn, domestic violence case co-ordinator, Community, Indigenous and Diversity Police Services, RCMP/Police – North East Nova and a member of the Interagency Committee on Family and Sexualized Violence, watched her sign the proclamation. Since its inception in 1989, Autumn House has helped more than 5,000 people – more than 50 per cent of them women – deal with the effects of family violence. A Statistics Canada document titled Family Violence in Canada: A Statistical Profile 2017, the latest statistics available, indicated intimate partner violence accounted for almost 30 per cent of all police-reported violent crime in Canada in 2017 and affected almost 96,000 victims aged 15 to 89. The document also indicated eight in 10 victims of intimate partner violence were women. The federal statistics, while only dealing with intimate partner violence, demonstrate the need to address the issue through events like Family Violence Prevention Week, said Dawn Ferris, Autumn House executive director and a member of the Interagency Committee on Family and Sexualized Violence. Family Violence Prevention Week is being promoted by the Interagency Committee on Family and Sexualized Violence, a collaboration of the RCMP, the Amherst Police Department, the Department of Justice, the local ministerial association, Mental Health, Autumn House, New Directions, Victim Services, Maggie’s Place, Nova Scotia Community College, the Cumberland Sexual Health Centre, the Cumberland Sexual Violence Outreach Program, the Community Bystander Empowerment Project, Addiction Services and Restorative Justice. The committee has been working for more than two decades to make people aware of the harm family violence causes as well as the resources in the community that support those impacted by family violence. Autumn House’s crisis line is 902-667-1200. It is a 24-hour service for people dealing with an abusive relationship.